did the below scan for one of the biggest builders in town which hopefully will lead to many more scans down the road. everything turned out really good with the scan except a few doors that appear open but I can't walk thru. worked fine. did scans with it closed then scanned from further away with it open and worked my way to it and thru it with no issues to scan the outside. used the same method as I did for the front door, scanned room first, opened door and scanned away from it and worked to it and then scanned outside. can go to the window looking at the patio and click on the circle and it lets me go outside thru the wall but then can't walk inside thru the door. add a few scans right inside and outside the door? did the hallway first and could only open the door 90' bc of a stopper. came back later and got the stopper off to open the door open 180' and scanned once right in the doorframe and it matched it up with the previous scans and then did the garage. guessing I need to come back in the hallway, open the door again and do 2-3 scans in the hallway with the door open to get them to match up and create a hole for the door? used the same method as I did for the front door, scanned room first, opened door and scanned away from it and worked to it and then scanned outside. can go to the windows looking at the deck and click on the circle and it lets me go outside thru the wall but then can't walk inside thru the door. add a few scans right inside and outside the door? originally scanned the bathroom right after the bedroom but was having issues with the mirrors so I kept getting scan errors. went to the hallway to scan, then closet, then bathroom and scanned it with the door closed. did one last scan right inside the door with the door open to the bedroom thinking it would then let you walk thru the door. thinking I need to add a few scans inside and outside of the bathroom with the door open to create the door, thoughts? i'm probably going to delete the outside scans walking down the patio and around the garage and just leave the front porch and corner deck/patio since I probably won't be able to do this on all scans and the exterior walls block views. I got lucky on this one bc it was cloudy and the sun was setting. looks like Matterport got rid of the WORKSHOP URL, is that right? If yo have a scan with a door shut you are telling the model that there is a barrier there. Even though you might have another 15 scans with door open, you have at least 1 saying it is solid and not an opening. Doors need to remain open if you plan on going through them. I was not able to walk out the front door, but I did see an artifact present as I transitioned from scan point to scan point approaching the door. If you go into the mesh view of the model, you will be able to see if there are any obstructions to any of the doors in the model. Also, just a friendly tip, in the long hallway with the the mirror in the bathroom, you don't want to stand behind the camera as it scans and you might consider setting the camera a bit off center as you negotiate the hallway to minimize the number of scans the camera is visible in the mirror. 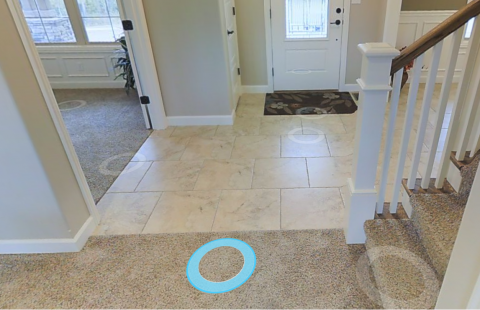 if you click on the blue scan, the door opens and then you can click on the scan on the front porch to go outside. I think the trick the distance at which you transition.